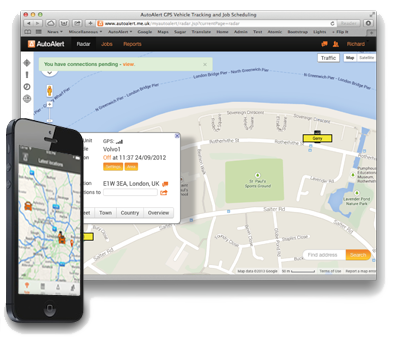 Yes – live tracking is available with all AutoAlert GPS Tracking devices. Yes, we have customers all around the world using our innovative GPS tracking system. Our devices work globally so you can see where your vehicle is wherever it is on the planet. Note: Our managed SIMS currently do not offer international roaming. If you are using an AutoAlert GPS tracking device outside the UK, then you will need to use your own SIM which works in the relevant country. How do I see my vehicles location? The latest location of your vehicles can be viewed from your account when logged into the AutoAlert website. You can also view your vehicles location on your smartphone or using our dedicated iPad and iPhone Monitor application which is available to download from the iTunes store. Our installed GPS tracking devices are designed to give you comprehensive reports which help you get the most from your vehicles as well as comply with regulations such as the working time directive. Do AutoAlert products have geo fencing? Yes. with AutoAlert it is very easy to set up as many virtual areas as you like using our unique point and click technology. Simply log in, select the areas on the map then choose how you want to receive notifications for each vehicle. How are AutoAlert units installed? AutoAlert products are designed with your needs in mind. We work closely with auto electricians and car manufacturers to make sure that our installed GPS tracking devices are easy to install and readily transferable between your vehicles. Our installed GPS tracking devices only require three wires to install and the device takes up very little space which means it can be hidden easily. Check out our installation guide for further information. If you do not wish to install the AutoAlert unit yourself, we can help with installation arrangements. Installation costs may vary depending on the vehicle, but are generally lower than with competing products as AutoAlert GPS devices are so much easier to install. Where should I put the antenna to get the best results? The AutoAlert antenna can be located beneath glass, plastic and glass fibre. It cannot transmit through metal or metalised glass. Some modern cars have metallic windscreen coating to reduce glare; however, in most cases they have a small unmetalised panel which can be used. Some older cars have dashboards made of metal. If the antenna is located close to large metal objects you may experience reduced signal. We recommend the antenna be placed at least 100mm away from such objects (pillars, bars, satnavs etc.). Are AutoAlert units transferable between vehicles? Yes. The AutoAlert unit is fully transferable. It can easily be swapped between vehicles, with configuration and alert telephone numbers changed from the main radar screen by simply clicking on the vehicle and choosing settings. If you wish AutoAlert to arrange the transfer then this can be done using our qualified engineers. Do AutoAlert products work in a garage? Yes. AutoAlert products can send messages from a garage or car park as long as there is enough mobile network coverage. However, the GPS device may not be able to get a fix on its exact location within the garage. When your vehicle leaves the garage or car park, then its exact location will be updated and be available for viewing. Do I need any more hardware or Software? No. All that is required to view your vehicles locations is a mobile telephone and/or web browser. No more hardware, software, contracts or systems are required to view any of the AutoAlert features.